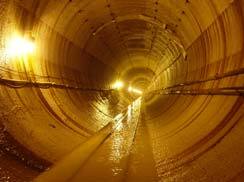 As part of a continued effort to renovate the Milwaukee area wastewater collection and treatment system, the Milwaukee Metropolitan Sewerage District (MMSD) constructed the Northwest Side Relief Sewer, a 20-foot inside diameter, 37,000 feet long rock tunnel. The $117 million project is the first step in MMSD’s 2010 Facilities Plan. The new tunnel will add approximately 88 million gallons of capacity to the system. Bedrock conditions were expected to consist of dolomite and limestone underlain by shale. NTH Consultants, Ltd. assisted the MMSD’s engineer (MWH) in performing extensive rock mapping during the tunnel mining stage of the project. The rock mapping was used to identify potential weak zones by locating and identifying rock formation characteristics such as lithology, fractures, bedding planes, and seepage. In addition, initial construction support information was documented that included the location and identification of initial support mechanisms such as dowels (rock bolts), straps and steel mesh used by the contractor during the mining stage to stabilize weak rock zones or areas of high water infiltration. Observations made in the tunnel were recorded graphically based on a pre-established tunnel stationing system and also documented on a Descriptive Tunnel Log. The rock tunnel mapping information obtained during this exercise will be used to identify potential tunnel grouting zones, estimate water seepage rates, and derive recommendations for a cost effective tunnel lining system that will be tailored to the existing conditions observed, thus potentially saving the owner additional construction costs.